Mountain Lake Wilderness area, named for the privately owned Mountain Lake, a private lake located nearby that is one of only two natural lakes in Virginia. Mountain Lake Wilderness area was created in 1984 when the United States Congress designated a wilderness area. Formed to preserve the unique features of this forest region and to provide protected habitat for its inhabitants, today it consists of a total of 16,525 acres, of which about 2721 acres are located in West Virginia. Contained within the boundaries of the wilderness area is a highland plateau that is centered squarely over the Eastern Continental Divide. Elevations range from a low of about 2,200 feet and climb to over 4,000. The plateau itself is home to some of the most scenic areas of the forest, where isolated stands of hemlock and virgin spruce can be spotted, as well as a mountain bog and the ever popular War Spur Overlook. 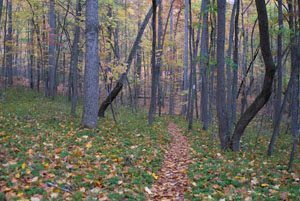 Trails crisscross throughout the wilderness area, ranging from easy for beginning hikers to more difficult to keep advanced hikers entertained. From these trails you’ll be able to fully appreciate the delicate beauty of the state’s forests. If you tread lightly and keep a careful look out for them, you might be able to spot some of the more than 43 species of mammals and the 70+ species of birds that call Mountain Lake Wilderness Area their home, such as gray fox, wild turkey, beaver, winter wren, black-capped chickadee, and cerulean warblers. To help manage and protect West Virginia’s 2721 acre portion of the wilderness area, the Mountain Lake Conservancy was formed. This non-profit organization also provides cultural and environmental opportunities for the public, and since 2008 it has managed and developed recreational opportunities for Mountain Lake Hotel guests and the local community.